Hardware and software designed to ensure your high-value cargo has not been tampered with while in transit. Each OpticalLock® has a unique signature that cannot be duplicated. Used in place of a traditional padlock, the OpticalLock is placed on the shipping container or storage room door (as well as anywhere else a padlock can be used) and its unique signature is electronically registered. While the room is unattended or while the container is in transit, OpticalLock include GPS location functionality as well as real-time quiet alarms with automatic wireless alerting which are activated upon any attempted tampering with the lock. Upon reaching its destination or when a storage room is accessed, the signature of the container’s OpticalLock is securely verified via our Field User Smartphone App, ensuring that it matches the OpticalLock signature registered in our encrypted, cloud-based database when the shipping container or storage room was originally locked. 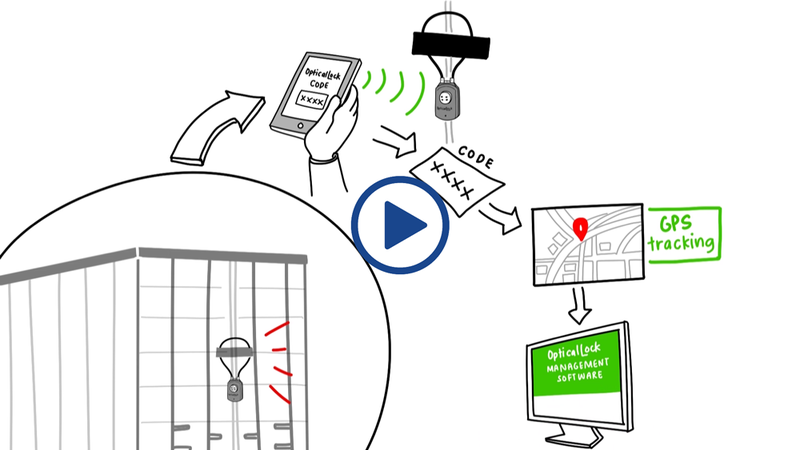 The OpticalLock system also features powerful, web-accessible management console software which enables the user to track the location of high value goods on high resolution maps, receive alerts on any tampering attempts or unusual events as well as manage your lock inventory and report on and analyze your usage data. OpticalLock® provides a high-tech, simple-to-execute solution to the world-wide problem of high value goods storage and cargo tampering. The product is based on proprietary fiber-optic technology and combines with web-based management software to provide secure, real-time mapping and wireless alerting of any anomalous events. Our Field User Smartphone App provides an added layer of security by ensuring that only authorized users can open locks that have not been tampered with without triggering alerts. OpticalLock’s technical approach provides manufacturers, shippers and customers with a high level of assurance that the contents of a storage room or shipping container with high value goods has not been tampered with while unattended or in-transit. The OpticalLock system is designed with the highest level of security in mind and includes multiple layers of data encryption. OpticalLock’s powerful management software reporting features enable both real-time control of all lock inventory as well as historical analysis for security and process improvements.